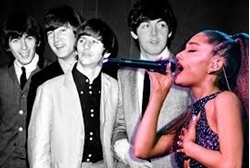 Ariana Grande and the Beatles have even more in common than sales records . Beatles Radio: The Beatles, Solos, Covers, Birthdays, News The Fab 4 and More! Ariana Grande’s recent and sustained run at the pop charts has been nothing short of a marvel. And like the great pop explosions of the past—Elvis Presley, the Beatles, and Michael Jackson, to name but a few—she is poised for immortality. And rightly so. During the week of February 19th, Grande laid claim to her place in pop music history. First, she tied the Beatles’ April 1964 record for holding down the top three spots on the Billboard Hot 100. With “7 Rings,” “Break Up with Your Girlfriend, I’m Bored,” and “Thank U, Next” lording over the Hot 100, she matched the Beatles’ 55-year-old record. As far as hit singles go, the Fab Four’s highwater mark was memorialized with the April 4, 1964, issue of Billboard, when their music occupied the top five chart positions—the only time in pop-music history that a single act has accomplished such a feat. With “Can’t Buy Me Love” holding down the top slot, “Twist and Shout” was second and “She Loves You,” “I Want to Hold Your Hand” and “Please Please Me” rounded out the top five.